I’ve always loved anything to do with makeup and hair ever since I was a little girl. I’ve always been the sister (Out of the 4 of us) who does everyone’s hair and makeup for a function. Or the friend that people came to for makeup and hair advice. 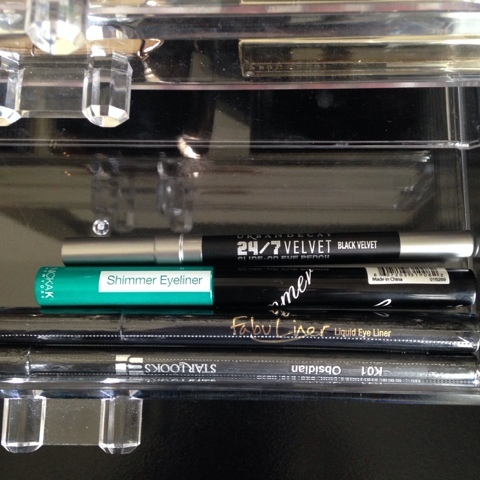 So I’ve always enjoyed buying new products and experimenting with them. But I’ve never, and I repeat never, had my obsession need a whole corner in my bedroom, 4 cabinets in different bathrooms and various other means of storage around the house. And I blame Blogging and YouTube for this little monster (that I’m still in the process of creating!) One thing that you won’t find me doing, is going into debt and spending money that we don’t have, just to buy beauty products! I buy what I can, when we can afford it. And I’m not ashamed of it. Actually, I’m quite proud that I don’t have every cool new palette that comes out, or every new lipstick that is the current “hype item.” I didn’t used to be this way though. When I held a full time job, I used to buy whatever I wanted all the time. But times are different now so I had to learn to adjust. I also had no idea that when I started blogging and Youtubing, that my beauty product obsession would grow into what it is today. I never used to want a vanity at all. I was always happy with just storing all my stuff in the bathroom cabinets, or dresser drawers. But right after I got really into the YouTube ” world” and started seeing all the vanity tour videos around, I knew that this was something that I just HAD to HAVE! I started looking online right away for one and pricing them and figured out pretty quickly that real vanity a aren’t cheap. The ones that I found and liked were all around $300 and up. I was in the process of buying new living room furniture for our home at that time though so there was no way we could afford that just for a vanity. So I figured that I better get thrifting. I searched for awhile to see if I could come across that “gem in the rough” at my local thrift stores. But, sadly that never happened. But, late one night while I was awake from insomnia, I found a perfect little “starter vanity” on Targets website. Well actually, my little “starter vanity” is actually a simple black computer desk with a single, shallow drawer. But I couldn’t pass it up for the price. It was on clearance for only $39.99 and with tax and shipping it came to right under $55. When compared to what the new and ready made vanities sold for, I thought this was a steal. So after I got the desk, I started my search for a mirror to go with it. I figured that I would find one with no problem somewhere like TJ Maxx or Ross, but I was wrong. Every one I found was either too big or too small. Wrong color or material, etc,etc…. I was going nuts trying to find one so that I could actually start using it. Then one day after the hubby and I had been at the beach all day we were driving up to our apartment and I noticed a black mirror leaning against the side of our community dumpster. I didn’t see any cracks or anything wrong with it from the car so I asked my hubby to please go get it for me. He laughed at me and said “are you serious right now? You want that mirror that’s been leaning against the trash all day?” I said “Sure, why not! One mans trash….” (You know the quote.) I can tell you that he did NOT want to go get it for me. First of all since it was by the trash, but secondly, because we live on the third floor so he had to carry it up four flights of stairs. 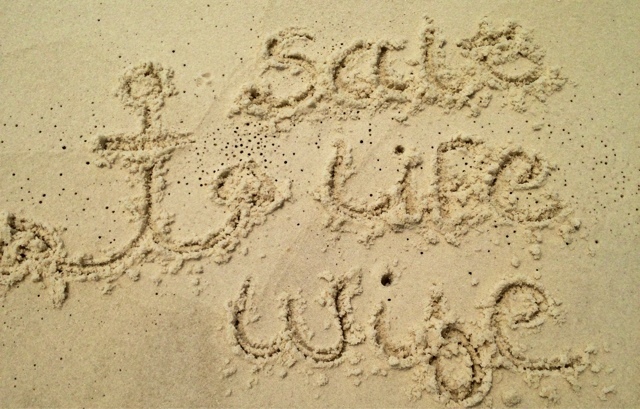 But he did it for me of course. And it worked out perfectly! I’m quite proud of my dumpster save! All I had to do was clean it up a bit, and then we attached it to the wall. It fit the desk like it was made for it. 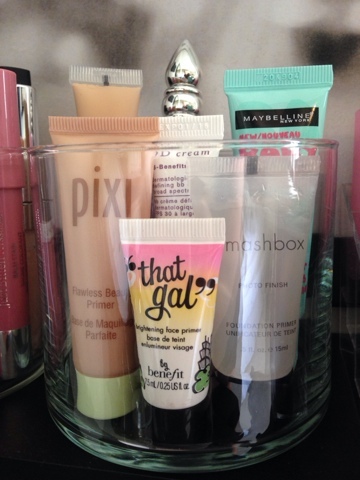 And it has the perfect little “lip” on it where I store some of my nail polish! I found this simple and cute little letter holder at my local Dollar General one day when I ran in to grab some paper towels. And I think I paid $5 for it. 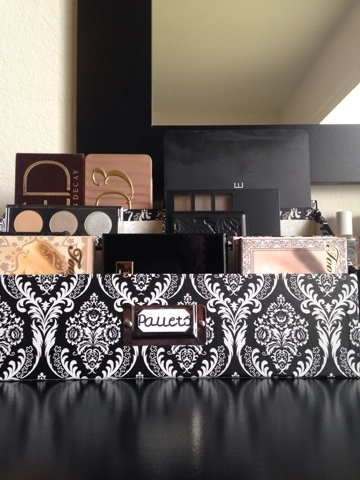 It not only looks cute, but holds my palettes perfectly. Then I went on the hunt for some acrylic storage. I still need more of it, but I did manage to score a great deal on this three drawer organizer from home goods for only. $12.99! And it is made very, very well! I was super excited when I found this! 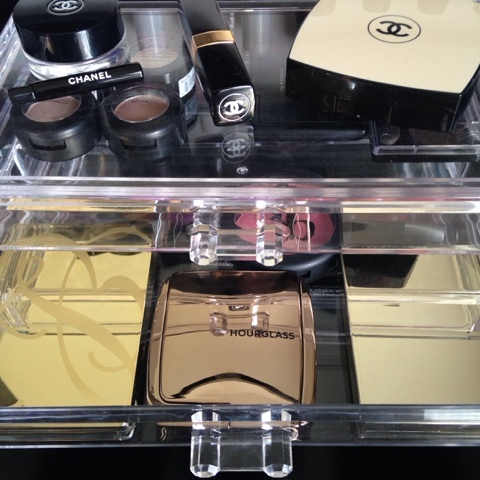 The drawers aren’t very deep but they hold just enough of my favorite products. Then for some brush storage I found this adorable little pen holder at my local Ross for only $3.99. I have the majority of my brushes in my train case that contains all of my daily use makeup items. These particular brushes that are pictured below haven’t even been used yet. 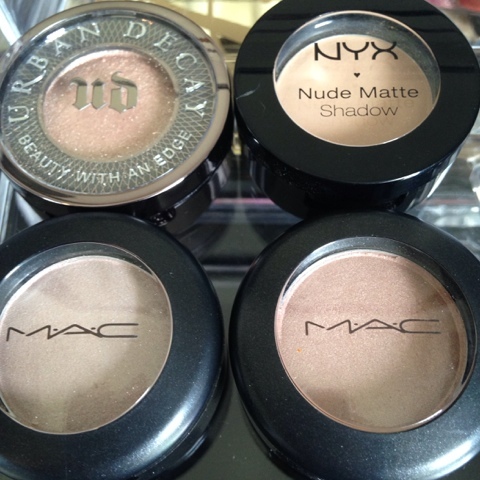 I just received them last week (look out for the review on them! Only $6 on Amazon!). 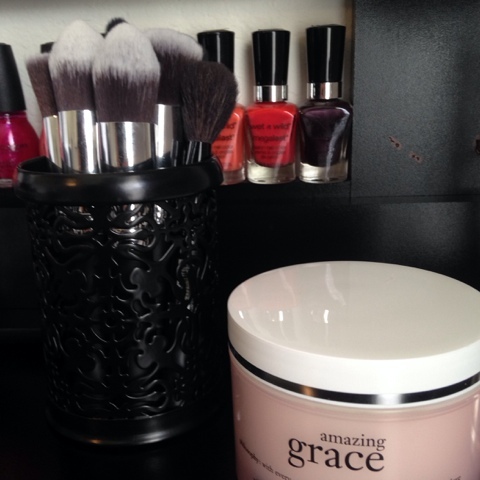 Then I just fell in love with the pretty Pink packaging on the Philosophy Amazing Grace whipped body cream so I just thought I would display it on my vanity as well. I’ve only had it a few days and I’m already in love with it too. 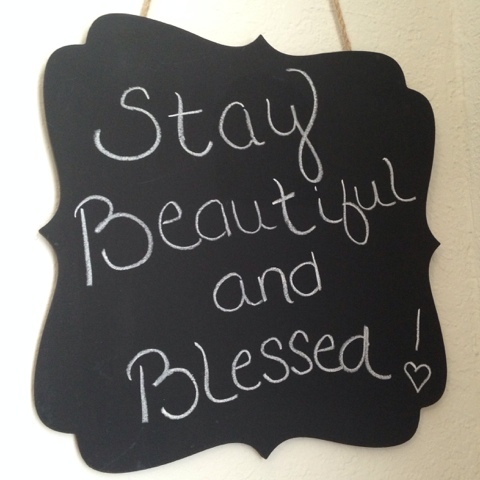 Then just for fun, I wanted a cute little chalk board where I could write different little quotes on it. And I found the perfect one last week at Kohls in the Picture frame section. 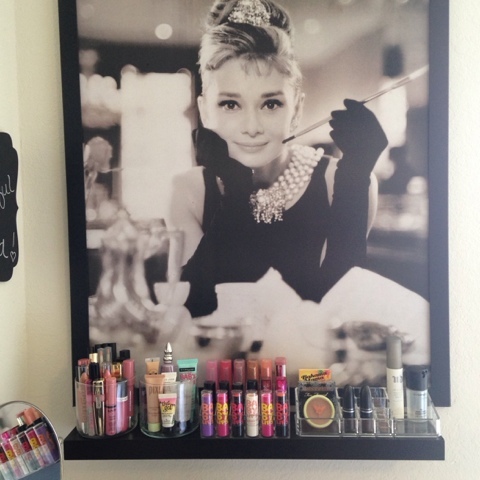 And next to my vanity, I have my favorite picture of Audrey Hepburn. I wanted this picture for such a long time and finally found a good deal on it through an online retailer who sells pictures and posters only. (Sorry I do not remember the website.) Below the picture, I hung a simple black “floating shelf” for more storage. And then I added my empty Bath and Body Works candles that house my lip glosses and face primers, and concealers. 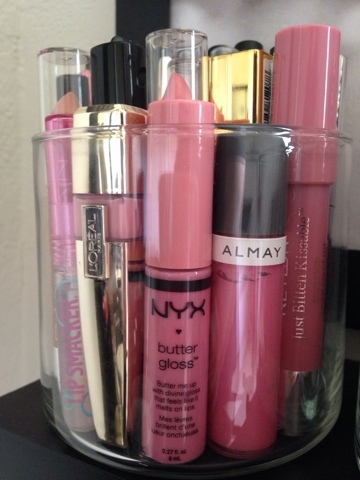 A lipstick holder that I bought off Amazon for under $10, and a small acrylic holder that has room for a few different types of items. All very cheap/cost effective storage that I am super pleased with. So what do you guys think of my “budget vanity?” I’m pretty happy with it overall and I’m still looking for the perfect chair to use with it. So for now, I’m using my Yoga ball to sit on. Hey, whatever works right!?!?! What great finds! I thought I was doing good by going to Ikea, haha. From your YT videos I always thought the vanity and mirror were a set- they go together so well! I love how you've set everything up, it looks great! I really think the little shelf was a great addition. I think I grabbed that from Target for around $12. We are planning on starting to look for another house to buy sometime after Christmas next year. And I want to have all the pieces I want before we move. I probably won't have an extra room to devote solely for my beauty room. But I will probably use our guest bedroom to put it in after we move. But I absolutely LOVE your room/set up! I'm jealous of how fab yours is!!!!! 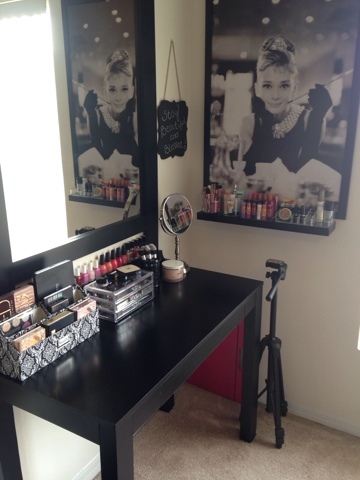 I love love love your vanity and the Audrey Hepburn print. And you have such a great makeup collection! 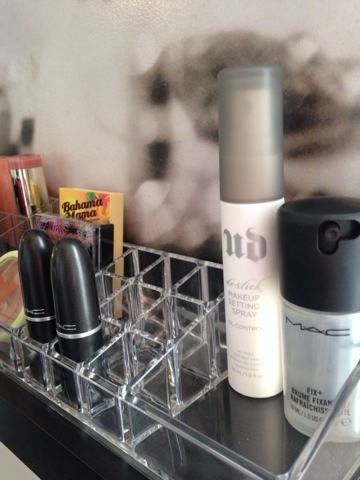 That mirror literally looks like it was made for your vanity! My theory is that God placed it there for you to find… it was his sweet gift to his princess.